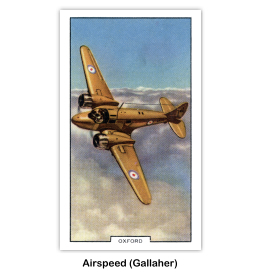 The Airspeed AS.10 Oxford was a twin-engine aircraft used for training British Commonwealth aircrews in navigation, radio-operating, bombing and gunnery during the Second World War. 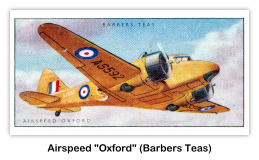 The Oxford, built to Specification T.23/36, was based on AirspeeD's commercial 8-seater aircraft, the AS.6 Envoy, designed by Hessell Tiltman. Seven Envoys had been modified for the South African Air Force as the “Convertible Envoy”, which could be equipped at short notice with a single machine-gun in a hand-operated Armstrong Whitworth dorsal turret, and with bomb racks. The Oxford was a low-wing cantilever monoplane with a semi-monocoque constructed fuselage and wooden tail unit. Its main landing gear struts retracted into the engine nacelles. It used conventional landing gear configuration. With a normal crew of three the seating could be changed to suit the training role. The cockpit had dual controls and two seats for a pilot and either a navigator or second pilot. When used for bombardier training, the second set of controls was removed and the space was used for a prone bomb-aimer. When used as a navigation trainer the second seat was pushed back to line up with the chart table. Aft of the pilots' area was a wireless operator station, facing aft on the starboard side of the fuselage. In the Oxford Mk.I a dorsal turret is located amidships. The aircraft could be used for training navigators, bomb-aimers, wireless operators, air gunners and camera operators. The Oxford could also be used as an air ambulance. A total of 8,586 Oxfords were built, with 4,411 and by Airspeed at its Portsmouth factory, 550 at the Airspeed-run shadow factory at Christchurch, Dorset, 1,515 by de Havilland at Hatfield, 1,360 by Percival Aircraft at Luton and 750 by Standard Motors at Coventry. The Oxford (nicknamed the 'Ox-box') was used to prepare complete aircrews for RAF's Bomber Command and as such could simultaneously train pilots, navigators, bomb aimers, gunners, or radio operators on the same flight. In addition to training duties, Oxfords were used in communications and anti-submarine roles and as ambulances in the Middle East. The Oxford was the preferred trainer for the Empire Air Training Scheme (EATS) and British Commonwealth Air Training Plan (BCATP) which sent thousands of potential aircrew to Canada for training. 27 Oxfords were on the strength of No 4 Flying Training School RAF Habbaniya, Iraq in early 1941 and some were converted locally for use as light bombers to help in the successful defence of the School against threatening and attacking Iraqi forces. In 1941, the aviatrix Amy Johnson went missing in an Airspeed Oxford, presumably crashing into the Thames Estuary. After the war, 152 surplus Oxfords were converted into small 6-seat commercial airliners called the A.S.65 Consul. A few Oxfords were acquired by the Hellenic Air Force and used during the Greek Civil War by No. 355 Squadron RHAF. Although the Oxford was equipped with fixed-pitch wooden, or Fairey-Reed metal propellers, the cockpit contained a propeller pitch lever which had to be moved from "Coarse" to "Fine" for landing. This was done to reinforce this important step for training pilots. 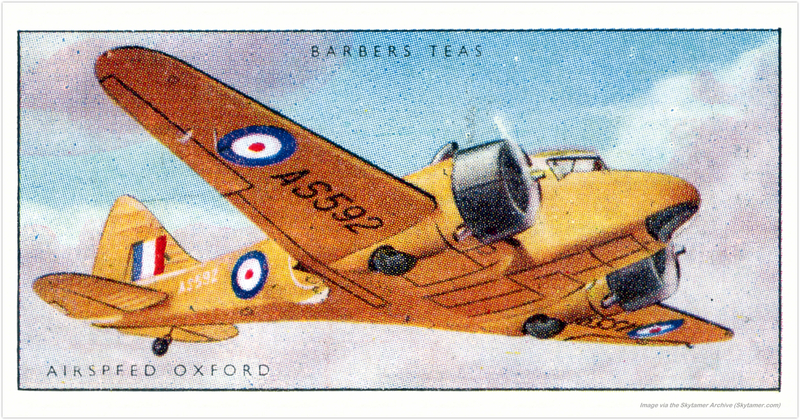 Oxfords continued to serve the Royal Air Force as trainers and light transports until the last was withdrawn from service in 1956. Some were sold for use by overseas air arms, including the Royal Belgian Air Force. 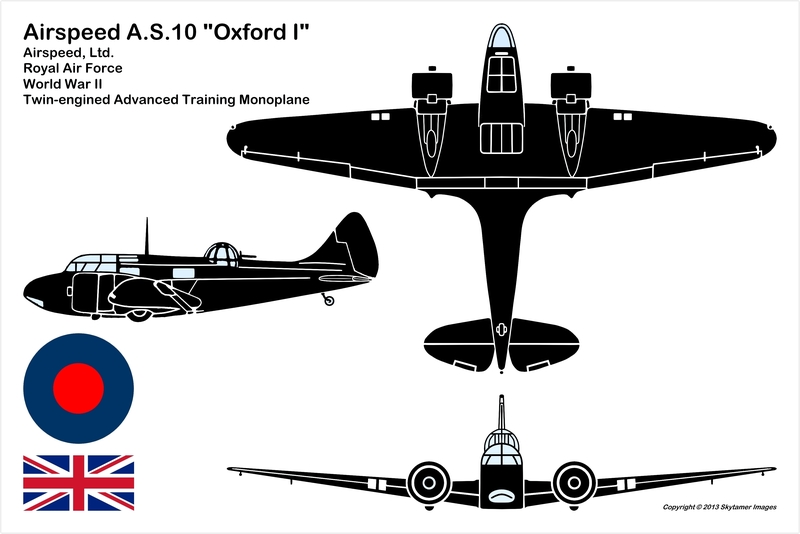 AS.10 Oxford Mk.I: To produce the Oxford I for the Royal Air Force, Airspeed increased the wingspan, modified the nose and employed fully cowled Armstrong Siddeley Cheetah IX radial engines of 350 hp (265 kW). The first Mark I flew on 19 June 1937 and entered service with the Central Flying School in November of that year. 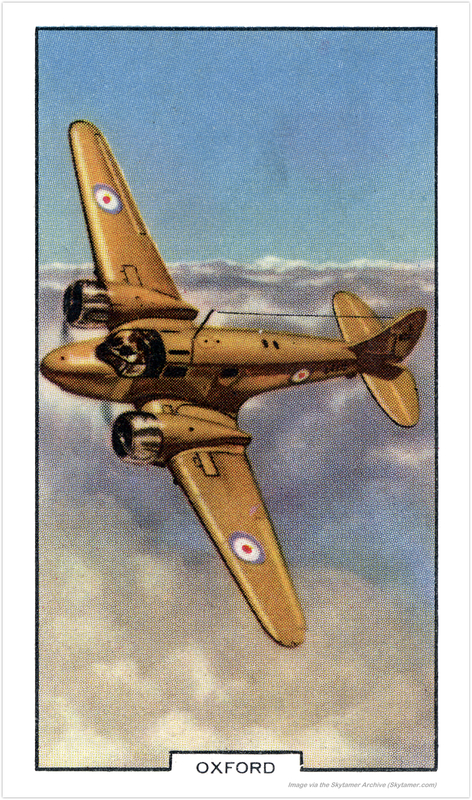 By the start of the war, about 300 Mk.I Oxfords were in service with the RAF, while a number were also being used by the Royal New Zealand Air Force to train pilots for the RAF. AS.10 Oxford Mk.II: The prevalence of powered turrets by the start of the war meant the Oxford's role as a gunnery trainer lapsed. The Oxford II, 70 of which were in service by the start of the war, dispensed with the turret and were used primarily as radio and navigation trainers. AS.10 Oxford Mk.III: Powered by two Cheetah XV engines with 425 hp (315 kW) and Rotol constant-speed propellers, used for navigation and radio training. AS.10 Oxford Mk.IV: Flying test-bed for de Havilland Gipsy Queen IV engines. 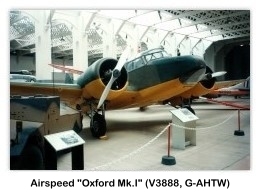 Oxford T.Mk.II: Only 9 of these were built, eight of them being conversions of Mk.Is. 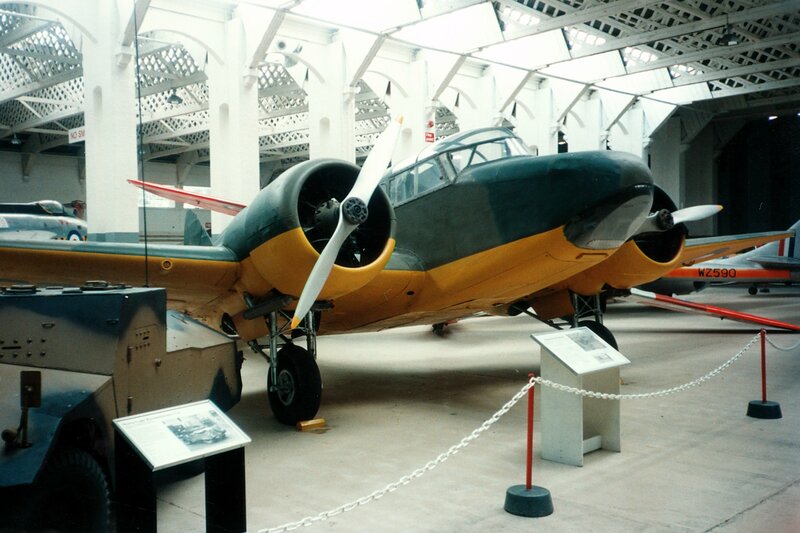 AS.40 Oxford: Civil conversion for radio research, two built. AS.41 Oxford: Used by Miles Aircraft as a flying test-bed for Alvis Leonides engine, one conversion. 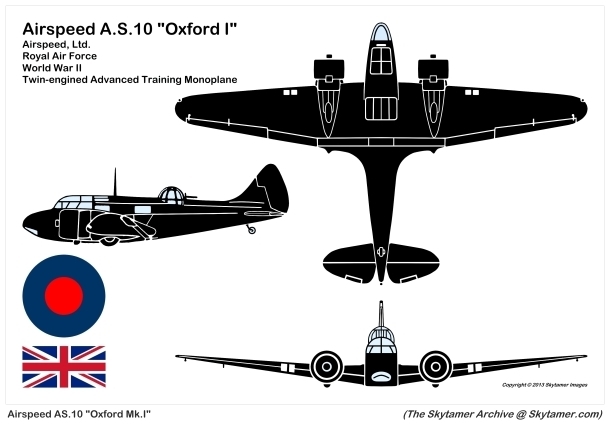 AS.42 Oxford: Oxford I to meet Specification T.39/37 for New Zealand. AS.46 Oxford Mk.V: The final variant, upgraded to Pratt & Whitney R-985 radial engines with 450 hp (335 kW) and Hamilton-Standard variable pitch propellers. Many Mark I and II Oxfords were upgraded to the Mark V standard. 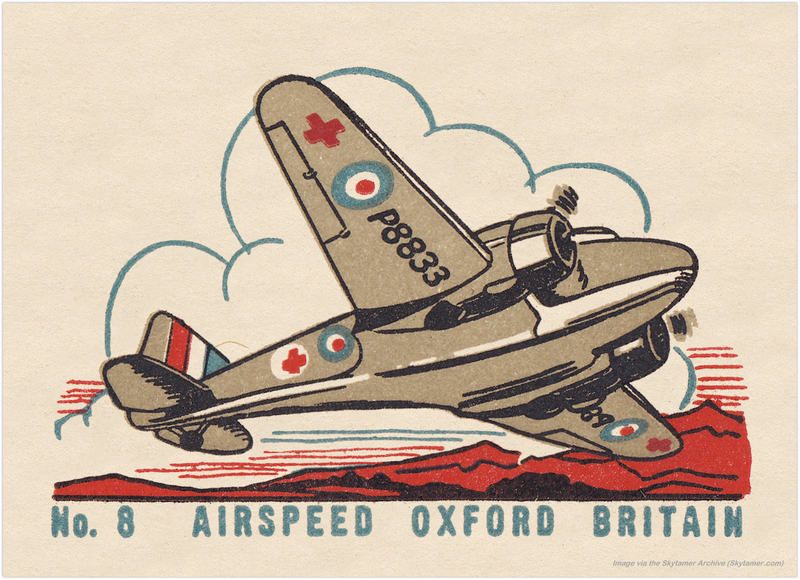 AS.65 Consul: After the end of WWII, over 150 aircraft surplus ex-RAF Oxfords were converted for civilian transport operation; this type was known as the Airspeed Consul. Center-section built separately from fuselage. Outer sections, of tapering chord and thickness, attached to center-section by four bolts and locking-nuts, one to each spar-joint. Bolts pass through tapered high-tensile steel plugs at each end to take shear. Wing-structure consists of two box-spars of spruce and birch three-ply. Former ribs of normal girder type, and in three parts. Special system of inter-spar bracing consists of built-up diagonal struts. Whole wing covered with plywood. Front section built as a unit and comprises the pilot's cockpit and cabin. It is of semi-monocoque construction. Rear section, also of semi-monocoque construction, has fin built integral with it. Wooden framework with fabric covering. Balanced rudder is hinged to fin only, with hinge-line inclined forward. Dunlop type low-pressure wheels and pneumatic wheel-brakes. Two 355 hp Armstrong Siddeley “Cheetah X” (“Oxford I and II”) or 425 hp “Cheetah XV” (“Oxford III”) seven-cylinder air-cooled radial engines on welded steel-tube mountings. Two-bladed fixed pitch wooden airscrews (“Oxford I”) or two-bladed D.H. constant-speed airscrews (“Oxford III”). 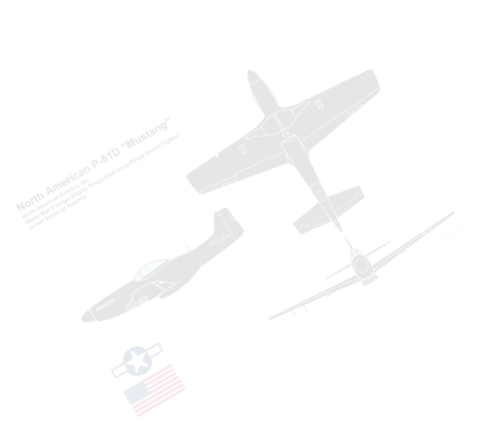 Alternatively two 450 hp Pratt & Whitney “Wasp-Junior” nine-cylinder radial air-cooled engines driving two-bladed two-position variable-pitch airscrews may be fitted (“Oxford V”). Two main fuel tanks in between spars center-section and two auxiliary tanks in outer sections interconnected with main tanks. Combined oil tanks and coolers mounted behind engines. Although crew would not normally exceed three at any one time, stations are provided for pilot, navigator or second pilot, bomb-aimer, wireless operator, rear gunner and camera operator. Pilot's cockpit in nose, with seat for second pilot or navigator. When dual control it is not in use, the space for the prone-bombing position is provided by removing the second set of controls. When navigator is carried, he occupies the second pilot's seat, which is pushed back in line with chart table. The wireless operator is accommodated on a seat on the rear spar, facing aft, on the starboard side. A rear gunner's station, provided with an Armstrong Whitworth gun-turret may be located amidships ("Oxford I" only). The "Oxford" has also been equipped as an aerial ambulance. 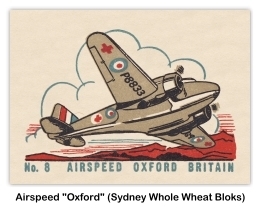 Bridgman, Leonard, “The Airspeed A.S.10 Oxford”, Jane's All The world's Aircraft 1943-44. Sampson Low, Marston & Company, Ltd., London, 1944, pp. 8c-9c.